We're at that weird time where winter isn't fully gone yet spring isn't quite here yet, which makes it difficult to dress at times. 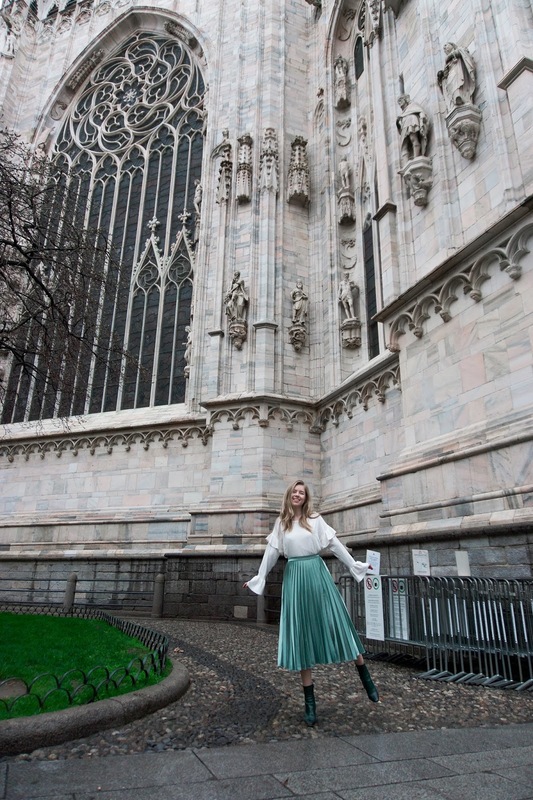 As you can see, almost everyone surrounding me in Piazza del Duomo in Milan is wearing dark colors and not letting winter go. In the meantime I'm over it and embracing an imaginary spring. As a very wise person once said "Life isn't perfect, but your outfit can be". There a few tips and tricks how to dress for the in-between season while staying stylish and in this post I'm going to share them with you. If you have any tips share them below, we can all help each other out to keep chic this season. 1. Be mindful of the actual temperature in your city. This is quite obvious, but don't get sick because you wanted to wear a cute outfit and froze the whole day. Wear a thermal cami or blouse with thermal tights under your outfit to keep warm without jeopardizing your style or health. 2. Mix pastel colors into your style to incorporate that spring vibe. Depending on your style it might be easy to opt for a pastel bag or shoes as it's the effortless way of introducing pastel seeing you can style it with monochrome or neutral outfits. Wanna go all out? Then choose a dress or skirt or even coat, this will catch the eyes easily making you the queen of pre spring styling. 3. My favorite tip of all time that somehow works for everything, layering. Adding a bomber or aviator or leather jacket will help you wear over the top spring floral lace looks while still looking appropriate for this time of the year. Bonus: This season just add futuristic sunnies for an extra cool look. WOW! That skirt is so gorgeous on you! I LOVE the silky material and the color! That skirt is gorgeous, love the colour! And great tips, I've been wearing my thermal top under my clothes too so I can start wearing lighter jackets.